Sunrise paints the Mount Evans summit gold as it lights the Front Range. I deployed my widest angle lens to capture Summit Lake, the summit ridgeline, Grays Peak (14,267') and Torreys Peak (14,270'). 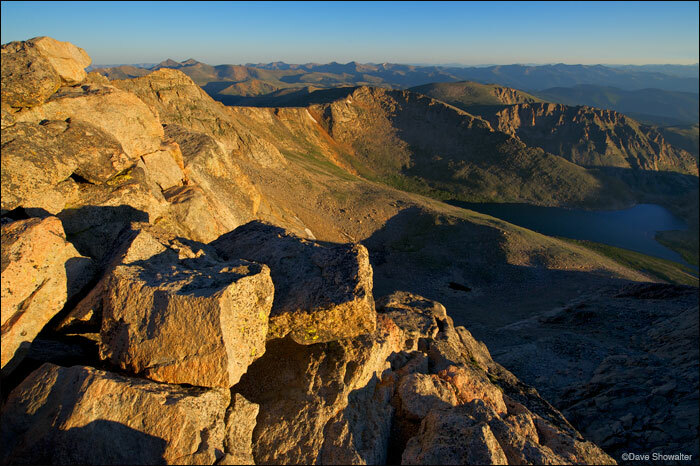 Mount Evans can be accessed by climbing, hiking, or using the highest paved road in North America, my choice on this summer morning. Photo © copyright by Dave Showalter.